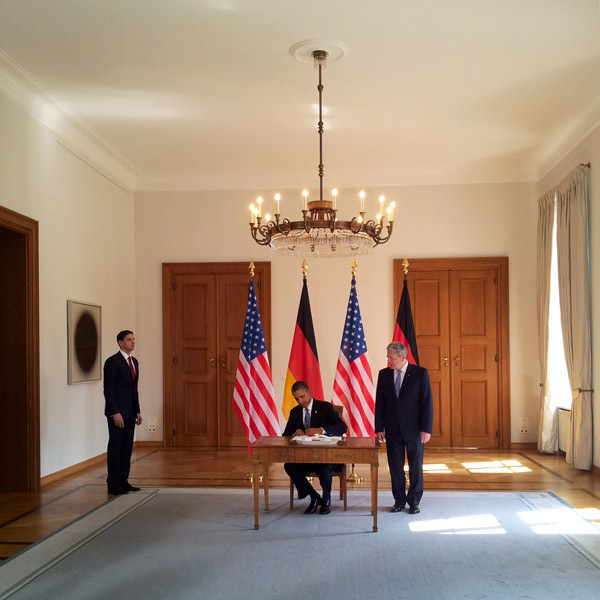 The recent complaint of the White House Press Photographers about their working conditions and not being granted access to cover some angles and moments in the presidential life, reminded me of Mr Obama’s visit to Germany last June. It was one of those rare events when I had applied for accreditation to cover a daily politics event on my own. Once on the scene I was forced to realize again – as on other events photographing top politicians – that we were allowed to cover certain parts of Mr Obama’s visit but didn’t have much possibility to author our pictures, because all the usual variables were pre-managed: the light, the distance, or even the range of angles we are allowed to photograph from. Thus, as I was not there on assignment, I started photographing simultanously using my mobile phone in parallel and achieved the results below. I did that after realizing that I was only depicting completely pre-planned and pre-arranged scenes as with a mobile phone you cannot adjust anything except for a limited exposure level of -2 to +2. Thus you just imminently depict the given situation. Sometimes a casual side scene is more powerful than the carefully staged scene presented by the photography advisers of the government. 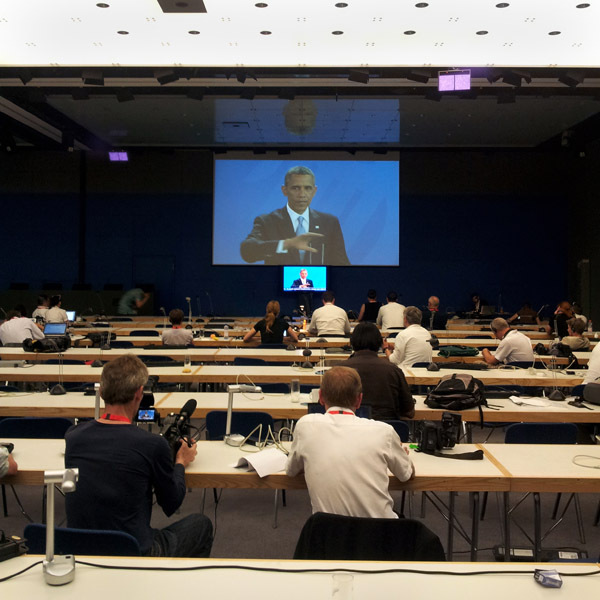 In his press conference, Mr Obama denied spying in and from Germany. It didn’t take long before the truth came out. 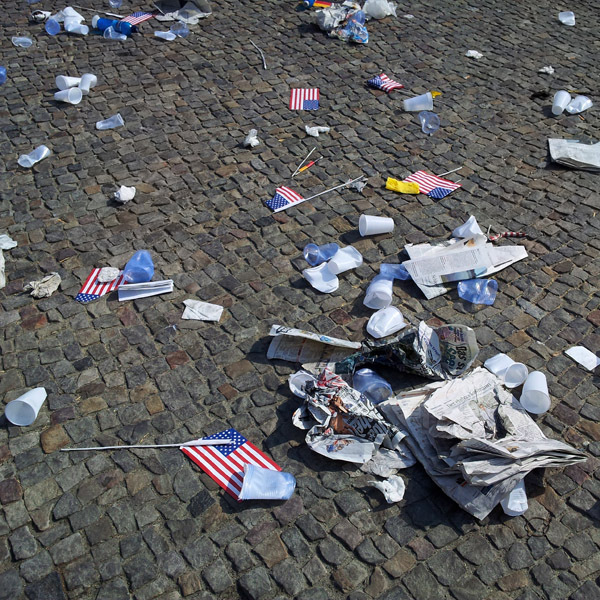 In the case of Obama’s visit the security measures were stricter than usual. Even the audience attending the speech of Mr Obama and Mrs Merkel was hand picked. 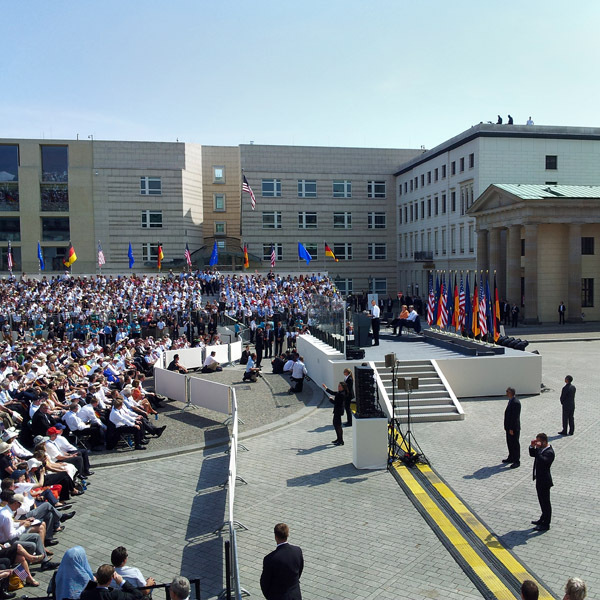 Furthermore not only the German security forces were there but also members of the United States Secret Service – Men in Black on the right of the picture above – were acting on their own and even restricting the access of German Government photographers on some occasions. In my opinion, photographing top politicians has become a staged matter since long. Whether with shots from special angles or not, it is staged. It is also notable that only five years after Obama taking office, major news organizations are leading the protest against the policy of the White House. Could this be because they have registered a significant decrease in their revenues? Even if photographers were allowed to photograph from the very same angles the official White House photographers are having access to, wouldn’t that be depicting staged scenes? At least now, media consumers know that they are looking at the so-called propaganda material as long the correct byline “Official White House Photo” is included next to the published pictures. But when independent photographers and photojournalists depict staged and carefully pre-planned scenes or even stories, and publish them in the name of independent photojournalism, isn’t that the ultimate victory of the propaganda machinery over the free press?